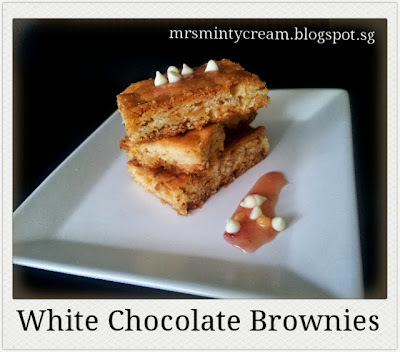 Also know as Blondies, white chocolate brownies are the sweeter version of their sister, Brownies. If you are kind of sick and tired of our usual brown/milk chocolate (like I am), then you may want to play around with white chocolate instead. I have recently expanded my baking collection with some new baking pans from Wiltshire! Yeah! Non-stick pans are my favourite! But the problem arises when I was preparing to bake these little darlings. Because I do not have a square baking tin as required in the recipe, I have to make use of what I have. Being the indecisive me, I could not make up my mind whether to use the Slice Pan (273 x 175 x 32mm) or the Oblong Cake Pan (335 x 230 x 45mm). On one hand, i did not want my blondies to be too thick and dense, but on the other hand, I wasn't sure whether the batter was enough to spread through the cake pan. Haha! Talking about being indecisive, I must be the classic of the classic! 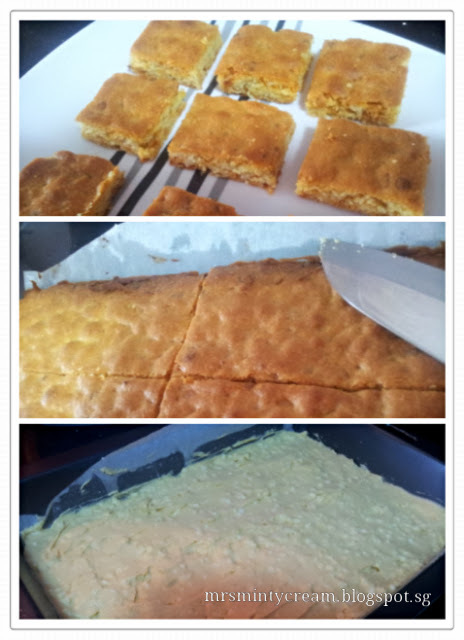 Anyway, I was greedy as I wanted to be able to bake as many of these blondies as possible as I have friends coming over. So, I decided to use the Cake Pan. WRONG decision! Haha! It caused my blondies to be too thin and it turned out that they were kind of overcooked (don't worry, they were not burnt) and the texture became somewhat in between a brownie and a soft cookie. 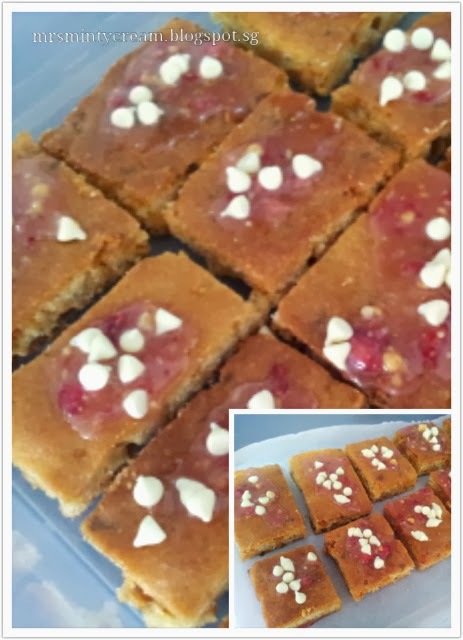 Hubby called them the white chocolate cookies (not brownies) and he finished all of them in just 2 days. What can I say? I am so grateful to have my hubby as my all-time supporter and he makes my life that much easier by being the easy-eater who he is. Thank god he is not that much of a fussy eater. Not to worry, I will be trying out this recipe again, once I get my hands on a new batch of white chocolate. 2. Grease baking pan by spraying a layer of non-stick spray on it before lining the base with non-stick baking paper. Set aside for later use. 3. Sieve the dry ingredients (flour, baking powder, salt) and set aside. 4. Add 2 tbs of flour to the white chocolate chips and mix well, making sure that all the chocolate chips are well-coated with a layer of flour. This will ensure that the chocolate chips will not sink to the bottom of the batter. 5. In a mixing bowl, cream the soft butter and sugar together using a whisk. When a creamy mixture is obtained, add in the egg, vanilla extract and sour cream. Mix well to get a smooth mixture. 6. Using a spatula, fold in the flour mixture (1/3 portion at a time) into the wet mixture in Step (5) and make sure that the combined mixture is well-mixed, with no trace of flour. 7. Add in the white chocolate chips and fold it into the mixture. 8. Spread the batter evenly in the baking pan. Shake it gently to ensure that the batter is level. 9. Bake for 25 minutes. Set aside for it to cool completely before cutting into bars. 10. To make the strawberry icing, melt the white chocolate chips and butter in the microwave/ oven. Once melted, add in pureed strawberries and icing sugar. Whisk well until mixture is smooth and well combined. Add in milk, if necessary, to get the correct consistency of the icing. Set aside. 11. After cooling and cutting up the brownies into small bars, brush a thin layer of the strawberry icing on top of each pieces, to get a glossy glaze. Garnish with a few white chocolate chips before serving. It will take some time to melt the white chocolate chips for the icing. Be careful to check and stir the butter & chocolate mixture when they are in the microwave/ oven. The white chocolate chips tends to burn a little instead of melting well (unlike milk chocolate chips). In addition, you may also add in some macadamia nuts in the brownies if you like the nutty texture!